Other - Intense,big. Farmyard by the shore. Dry straw,briny whiff. Then a fruit note spring up. Autumn fruit. Apples and pears and sultanas. Palate: Lusciously velvety. Deceitfully smooth then a spicy outburst shakes the tastebuds. The sweetness comes back with maltynotes. Finish: Soothing on caramelised nuts. Hint of nougat. Touch of smoke. Salty feel. The palate does not show as much complexity as the nose and finish. But a rich interesting character. Back to smoke, this time with an added leathery note. Smoldering leaves,malt,cypress wood. Smooths slightly with water but still robust with dense smoke,salted fish,dried seaweed. Oily rich and rewarding. Would be great with sashimi. Palate: Slow and chewy. Fine grip. Broad and complex. Needs water to bring out a mix of dry/charred smoky notes. The polar opposite to Talisker 18. Rugged and warming. Skye is home to only one distillery, but my, what a distillery. One of Diageos finest, Talisker is a highly distinctive whisky with a strong, smoky, peaty flavour because both the malt and the water used to make it are heavily peated. Talisker was built in 1831 and named after Talisker House which was traditionally the residence of the eldest son of the Macleod clan. The stills are great onion-shaped kettles, richly gleaming and radiating heat, with ever-narrowing swan-neck tops which gracefully lead their vapours away through the stillroom wall to cool and condense beyond. 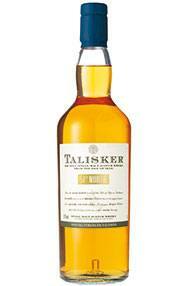 There are five stills at Talisker, two large ones for the first distillation and three smaller for the final. Their precise size and shape, even the angle at which the swan-neck lies, are vital to the continuing production of spirit with the authentic Talisker signature in aroma and flavour.